Having teamed up with a bar for its previous limited release, it’s pretty clear Stockade enjoyed the experience as the brewery has gone and done it again for the follow up. The venue this time is Mjølner, a new joint in Redfern that channels the ancient art of the Viking feast – think whole animals on a spit roast and you're in the right longboat. And what Viking feast is complete without beer? None, presumably, which is where Odin’s Raven comes in. It’s based on a Belgian witbier, so it’s not exactly a Nordic beer through and through, but there’s some Scandinavian sensibility in here. Specifically, that comes by way of the use of junipers, an ingredient pretty well everyone knows as a component in gin but which the people of Northern Europe use in place of (or in addition to) hops to brew a specialty beer called sahti. But where those beers are typically brewed with juniper stalks, Stockade and co have used the berries. What that translates to is a beer that has classic wit characteristics in the aroma and on palate thanks to the use of coriander and, in particular, orange peel. The junipers seem to join the party quite late in the piece, most notably contributing a tart and dry finish. 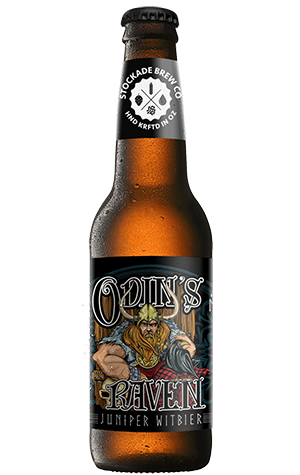 But, all up, Odin is a surprisingly spritzy wee number that’ll have citrus, sharp fruits, a herbal element and even a honey sweetness zipping around your mouth – enough flavours to match it with most any Viking feast. If you're reading this in time, you can try it for free at the beer's launch on May 9.